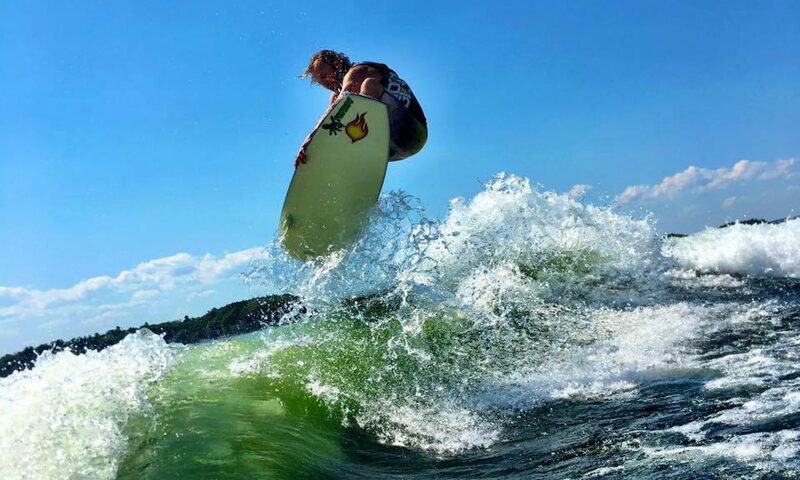 Using a specially designed surfboard ranging from 4′-5′, wakesurfing allows a rider to surf on one side of the wake generated by a ballasted inboard towboat (where the propeller is safely located underneath the boat, versus behind the boat on traditional outboard motor boats). To get started, a rider holds a tow rope to pull themselves out of the water and using the ‘push’ created by the wave, will find the ‘sweet spot’ and ultimately drop the rope to surf the steep face below the wave’s peak generated by the boat. Unlike ocean surfing (where a wave only lasts 12-16 seconds), wakesurfing allows you to surf the endless wave until your legs give out or the boat runs out of gas, whichever comes first! Most runs average 1-2 minutes or longer, depending on your level of experience. Boat speed is much slower than traditional water sports ranging from 10-12 mph, so there is very little impact or chance of injury! Depending on your stance (regular or goofy) will determine the side of the wave you ride. What’s the difference between surf and skim style wakesurfing? Surf style is closer to ocean surfing with respect to the style of riding and board, and it also incorporates some of the same tricks. A surf-style board usually has more fins (Thruster/Tri Fin Quad Fin, 5-Fin, Twinzers, etc) for added traction, which allows for more aggressive turns and airs, but more challenging to spin. They are mostly constructed with fiberglass and a wood stringer (like ocean surfboards) which makes the board lively, but also more susceptible to dings and damage. Skim style uses mostly flat boards with very little rocker that spin very easily. The boards are compression molded making them very durable, but also less lively. These boards are very similar to ocean skimboards where riders toss the board onto the shallow shores of the beach and run into the ocean snapping 180º off the oncoming wave and riding it to shore. Skim style tricks combine skateboarding & wakeskating including technical spins, shove-it and airs. Ballast makes the wakesurf boat (aka tow boat) sit lower in the water, and heavier on the side we will be surfing on. Ballast is necessary to build a wave that you can wakesurf. Wakesurf boats have compartments or bladders (like a water bed liner) built in below the boat decking and/or under the seats that are fitted with 2-way pumps to control the filling/emptying of these compartments in order to make the best wave possible. We are open early June through late September. With that said, we’re known to be out there as early as April (with dry suits and warm clothes underneath!) and into mid-October. If you’re as hyped on wakesurfing as we are, we’re happy to get out early/late season! During the summer months, we can continue to surf past 8pm and into the sunset. What’s the difference between regular and goofy footed wakesurfing? Regular Foot = wakesurfing with your left foot forward on the PORT (left) side of the wave; the majority of right-footed people will surf regular foot! Goofy Foot = wakesurfing with your right foot forward on the STARBOARD (right) side of the wave; the majority of left-footed people will surf goofy foot! How will I know if I should wakesurf regular or goofy foot? Standing behind you, have your partner gently push you forward by the shoulders, enough to require you to take a step forward to catch yourself. Whatever foot steps forward is the foot you should place on the FRONT of the surfboard. How do you change the wave from one side to another? The ballast and surf sacks are all automatically controlled by (5) on-board 2-way pumps, so when it’s time to switch from regular to goofy (or visa versa), it’s simply a matter of pressing the “regular” or “goofy” button on the touchscreen dash and let the system do the rest! It takes approximately 7 minutes to switch over sides. Can I get injured by the propeller? No. An inboard tow boat is engineered with the propeller beneath the boat versus the propeller on an outboard boat, which is on the very back of the boat/engine and could cause major injury or death in the event you were to come in contact with it while underway. Can I wakesurf behind an outboard motor boat? NO! Doing so could cause major injury or death in the event you were to come in contact with the propeller of an outboard engine while underway. Do I have to wear a life jacket when wakesurfing? Yes. A life jacket (also known as a PFD, or Personal Floatation Device) is required while wakesurfing with us. Safety is our #1 priority on the water and in the event you were somehow knocked unconscious, a USCG-approved life jacket will help to righten you up and turn you over making it easy for others on the boat to safely reach you. Without a life jacket, too many things can go wrong. Our insurance policy also wants to make sure you’re wearing one too! How many times does it take before I can get up? Let go of the rope? This all depends on the level of experience you may have with any board sports combining balance and muscle memory in some capacity such as skateboarding or snowboarding. Experience with water-related sports isn’t required but helps to understand what it feels like to be towed. We’ve seen surfers get up on their first pull, and we’ve had some individuals that need more time to get their feet under them. No matter how quick you pick it up, our coach will work with you to make sure you’re digging in your heels and letting the boat/driver do the rest of the work! Can you describe the process of getting up behind the boat in more detail? Yes! See our “How to” section! What’s the “sweet spot” in regards to the wave? This is the area of the wave where the surfer feels the ‘push’ driving them forward and causing the tow rope to go slack. The next step is tossing the rope! What are the best days/hours to reserve for wakesurfing? Lake Champlain and Malletts Bay are calmest in the morning and evening hours from early morning through 11am and after 5pm. With that said, Malletts Bay is very protected from the wind and great water can be found throughout the day, so there’s no need to scramble out there early/late in the day! Mondays seem to be the quietest on the lake, when the majority of local boaters head back to work for the week! Can we bring our own boards? Sure, you’re welcome to bring your own gear – please be responsible for it! Are you insured? What credentials do you have? Yes! Both our boat and school are fully insured. Our driver/coach is certified USCG captain, American Red Cross CPR/First Aid certified, and USA Waterski Level 1 certified instructor. Both Captain’s License and USA Waterski certification also requires passing criminal background check and drug test.